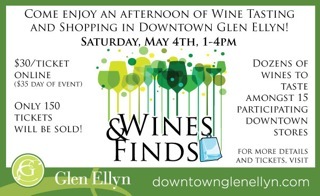 Come join the merriment in downtown Glen Ellyn this Saturday, May 4 from 1 pm to 4 pm during Wines & Finds, a premiere wine tasting and shopping event extraordinaire. A wide variety of wine distributors will be offering samples and wine experts will be on hand to answer questions and take orders. Only 150 tickets will be sold. Visit downtownglenellyn.com for more information. 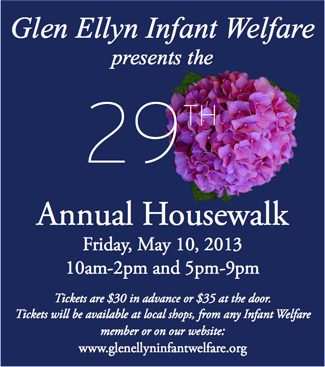 Marcel's is happy to once again dress the tables for this year's Glen Ellyn Infant Welfare's Annual Housewalk on Friday, May 10th. The four beautiful homes that are showcased during this year's Housewalk are all different and special. Get some great decor ideas, be inspired and donate to a great cause. Tickets are available at Marcel's. Visit www.glenellyinfantwelfare.org for more details. That's right....May 12, Mother's Day is right around the corner. 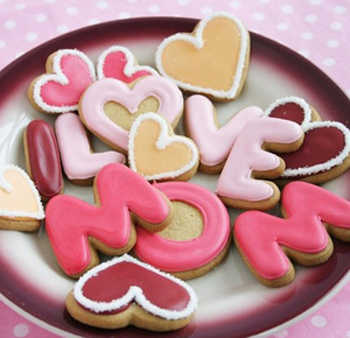 What mother would not love a gift from Marcel's? How about a LeCreuset enameled cast iron in her favorite color? The new Soleil pieces are here - a cheerful, vibrant yellow. Whether you know her favorite things, or haven't a clue, we can lead you to that perfect gift to let mom know how special she is to you. Have you downloaded the new Glen Ellyn app yet? Available on your smart phone, the app is free and will keep you abreast of all the PERKS and PUNCHES, or specials, happening at your favorite Glen Ellyn businesses and shops. Search "Glen Ellyn" in your app store and look for the Downtown Glen Ellyn listing. Use the app to locate Marcel's and redeem the PERK for 20% OFF any one item in the store. Use the PUNCH feature to keep track of your gourmet coffee and tea purchases and get your 6th one free. This is the 14th issue of our Cook Create Celebrate newsletter and we have had a great time bringing you information, tips, our favorites, and sharing articles and recipes from many of our staff and chefs. We try to be chock full of news but sometimes we can be a little too chock full and our newsletter gets a little long. As I mentioned a couple of months ago, we are redesigning the Marcel's website to give us a bit more flexibility and the capability to add features such as a blog. With this change, we will also be changing our newsletter. Starting in June, Cook Create Celebrate will be focused on events, news, and promotions and you will find your favorite columns such as Chef Talk and The Dish in the blog feature in our website. This will make the newsletter more brief and the feature articles will come to you one at a time every week or so instead of all at once. Look for these changes in early June -- and let us know what you think! Our sign of spring at Marcel's (despite what the thermometer tells us) is the return of Tussie Mussies! Brooke Ryan, renowned Landscape Architect, has brought her magic back to Marcel's with everyone's favorite Tussies! These colorful bouquets of flowers, herbs and greens are hand picked by Brooke and nestled in a reuseable Weck jar. The first Tussies of the season will be here Friday, May 3rd, and every Friday thereafter as the seasons permit. Quantities are limited, so make sure to come early to get your Tussie Mussie! Jill Foucré and Marcel's is profiled in the May Money magazine and also on-line at www.cnnmoney.com. Click here for the link to her fabulous interview in which she describes how she "spiced up her work life". This month is all about color! Spring flowers are blooming, trees are showing their leaves, and butterflies return to the air. Even the sky is bluer and the sun stays out longer! All this color is much needed after the long winter and cold, gray early spring that we all survived. Farmer's markets open for the season this month, too, and will be another place to enjoy color blooming. Green asparagus, kale and peas, red beets, rhubarb and radishes, orange carrots and white parsnips. There will be so many colors from which to choose. And nutritionally speaking, the more color in your diet, the healthier it it. Color is an indicator of the nutritional content, specifically the phytonutrients that are unique to brightly colored fruits and vegetables. Phytonutrients offer a variety of health benefits including protection from heart disease and cancer. The USDA Myplate recommends filling half our plate with fruits and vegetables at every meal. This recipe is one with lots of color to enjoy even before the Farmer's markets open for the season! In a large bowl, combine the edamame, corn, quinoa, green onion, red pepper and cilantro. In a small bowl, whisk together the olive oil, lemon and lime juices, salt, chili powder, black pepper, thyme and cayenne until combined. Drizzle over the salad and toss to coat. Cover and chill until ready to serve. Serves 4 main or 8 side dishes. Many of you are familiar with our Holiday Gift Baskets which were offered over the Winter holiday season. We are proud to announce the arrival of our Gift Boxes! We have 10 different gift boxes to choose from, all between $40 and $70. Each box has a "theme", including two Mother's Day gift boxes, and each are filled with some of our favorite items. Send one to your friend for her birthday, bring one to the host of your getaway weekend...quick, easy and guaranteed to please. Now available at Marcel's! 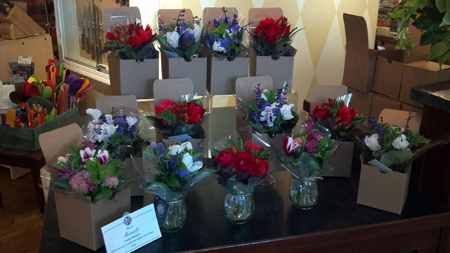 If April Showers bring May flowers, Marcel's is in full bloom! Take a look at what we've planted throughout the month! 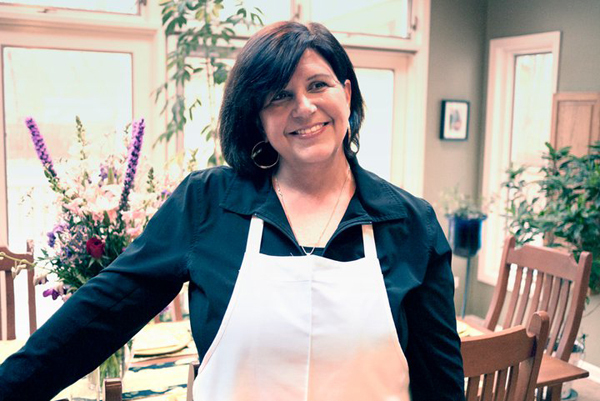 Mom’s the star as Lynn Dugan hosts Mid Kids; Lunch with Mom (5/5) and Chef Jean hosts a Midday Mother’s Luncheon (5/8). 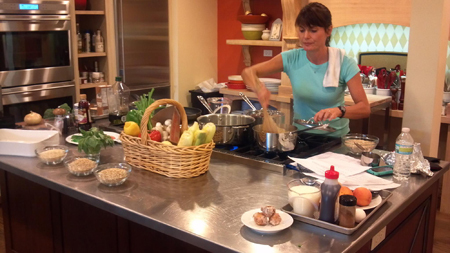 And not to be missed, Chef Jean brings her grown up boys to work in Cooking with Mom (5/11). Our newest class format, Twilight at Marcel’s, an evening demonstration class with wine and beer, continues with Chef Jamie’s Life is a Cabernet (5/7) and Chef Katie’s Communal Table (5/21). Answering your requests, Chef Robin is sharing Knife Skills (5/8), Chef Paul offers Techniques of Fish and Shellfish (5/16), and Lynn is going gluten-free in Cooking from the Market (5/22). Just in time for warmer days, patio evenings, and Memorial weekend, early summer fare is front and center in Al Fresco Evening with Chef Kelly (5/23), Regional Favorites of the Pacific Northwest with Chef Robin (5/22), and Midday Light Early Summer Lunch with Chef Katie (5/29). If one chef in the kitchen is good, imagine the benefits of two! Chef Jean and Chef Paul are hosting a Celebration Table of kitchen collaboration; two chefs, one menu, two influences. Combining French and Latin influences featuring dishes like Queso Fundido and Pork Tenderloin in Fresh Adobo and Goat Cheese Medallions with Salad of Frisee and Braised Pork Shoulder with Fennel and Lemon Thyme, now that’s a reason to Cook, Create, and Celebrate! April Showers Bring May Flowers - and Rhubarb! It's finally warming up and the yard is coming alive! I love the start of spring because it's a time to change up from winter cooking. The produce department at the grocery store now has abundant favorites such as asparagus, peas, radishes and Vidalia onions. Many local CSAs have begun deliveries and your own back yard is probably producing something edible. The rhubarb is poking through here and for my family, that means it is time for an old family favorite to be brought out again. Rhubarb has been a staple in many Midwest gardens for years. Most of my neighbors had a few plants when I was growing up and I inherited plants at my first and current homes in Glen Ellyn. If you don't have any growing in your yard, there is still time to get some plants in the ground. It is very easy to grow and does not require much attention. The first year you will not be able to harvest the stalks since the plant needs a year to establish. You will have plenty next year and in the meantime there is plenty to be had at the grocery stores now and then at the farmer's market through the end of June. I know that many pies and jams are made with the famous strawberry and rhubarb combination, but here at my house, we make Yummy Rhubarb Squares. It has a buttery crust, rhubarb filling, and a crumbly top. I hope you enjoy it! Mix filling ingredients in a large bowl and pour over partially baked crust. Set aside. For topping, combine flour, sugar and cinnamon. Cut in butter until mixture has crumbly consistency, then sprinkle over filling. Bake another 45 minutes, or until topping is light golden brown and rhubarb is tender. VITAMIX CONTAINER PROMO: Purchase any Vitamix and purchase a 32 oz or 48 oz wet container or a 32 oz dry container for $50 (regularly priced at $129 - $144) now through the month of May while supplies last. 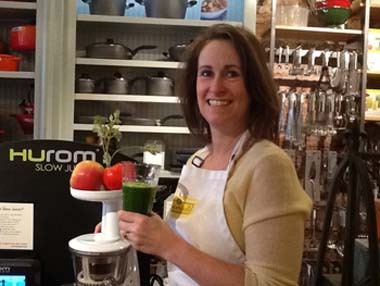 Learn more about what a Vitamix can do by attending our Vitamix Demo on Tuesday, May 28 from 11am - 2pm. LE CREUSET 8 INCH TRI-PLY SKILLET: Purchase any piece of in stock enameled cast iron Le Creuset cookware with a retail price of $200 or more and receive a beautiful 8 inch tri-ply stainless steel skillet with your purchase, retail vaule of $105. Good while supplies last. SHUN CLASSIC 7 INCH SANTOKU: Shun is translated from Japanese as "at the peak of perfection". Each Shun knife takes at least 100 handcrafted steps to complete. And now, the 7 inch Shun Classic Santoku is on sale for $124.95, regularly priced at $175. Add this fabulous tool to your kitchen now while supplies last.